A surprisingly brilliant thing happened a few years ago called Dear Esther. Dear Esther appeared to start the ball rolling for games that evoke emotion and deep thought in the player, without the player really doing anything. But that wasn’t the point. A poem, a narrator, a melancholy and sometimes haunting soundtrack, coupled with realistic but occasionally surreal-looking visuals and you, the player. From there, place you into an environment where you can look around, then find the points of interest so you can trigger the next verse of the poem. But that wasn’t the point. The much lauded and award winning Gone Home did much the same thing, bringing with it a really broody and tense atmosphere. While working through the story you just felt at constant unease. Ultimately you didn’t really do anything to reach the end, merely switch on some lights, find some secrets doors and feel frightened by the dark. But that wasn’t the point. Many stress that Dear Esther and Gone Home can’t really be called “games” at all, because “there’s nothing to do”. I, for one, think that they are games in the same way graphic novels are books; both books and graphics novels captivate the reader with a story and characters, presenting the adventure in different ways to achieve the same goal. That goal is to take the reader on a journey, perhaps to make them think or simply to help them escape for a duration. Dear Esther and Gone Home are capable of sowing powerful seeds, but you do have to be receptive to that style to get anything out of them. It seems justified, then, to refer to both Dear Esther and Gone Home as “Art”, given that the point is to make the player “feel” something as one might, looking at a picture in a gallery. The feelings may well be different for each of us, but it is the discussion of those feelings with others that makes art so powerful. 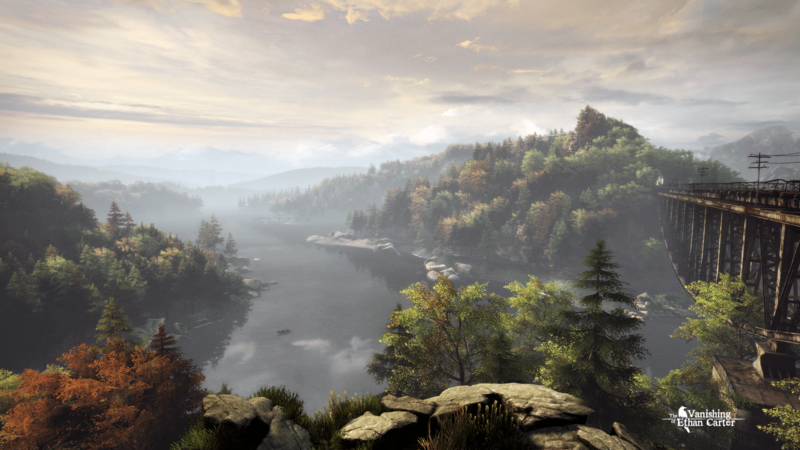 The Vanishing of Ethan Carter (TVOEC from now on…) attempts to arouse the unease and tension in the player and hand-on-its-heart claims it is a narrative experience. It is not wrong and it does prickle at your spine for its duration. I’m a believer that the ex-People Can Fly developers responsible for the likes of Bulletstorm, have done exactly what they set out to do, and on the whole TVOEC is a well constructed and thoughtful experience. Not knowing much at all about TVOEC when I loaded it up, I didn’t know what it was, or what to expect. I’d seen one trailer a few days before, but it wasn’t enough to explain to me what I was expected to do. In hindsight, since finishing it, I wish I’d known a little more about how to approach the puzzles. It would have helped me understand how to play the damned thing properly. As it was, I didn’t learn how to tackle puzzles correctly until a way into the story. This is because I was initially trying to play TVOEC as I’d played Dear Esther, but that’s wrong. You DO have stuff to do, meaning that this isn’t just an experience after all. There is a game in here to play, but it gives you no real advice on how to approach it. This is the point of course. Sure, there are prompts that pop up, helping you to discover plot points to begin your adventure, but there is a little bit more to it than that. You have to make up your own mind up with what to do and how to go about doing it. But without the basic information needed to progress; I found myself wandering the beautifully rendered forest scenery and beyond, without a flipping clue what I was supposed to be doing, missing the point entirely. To be honest – and i’m sure many will sigh disbelief and complain about what i’m about to say – I felt a twinge of boredom. But, eventually, it all begins to make more sense, but by which time, i’d failed to solve some of the riddles earlier on. While this doesn’t hamper my progress, it does eliminate the possibility of a full completion. TVOEC is not a massive game, even though the landscape in which you find yourself in feels huge. Given I missed the completion of the first few puzzles in my first play-through, I “completed” TVOEC in around three hours. I say completed, of course that just means I reached the point where I could see the credits of the game, effectively reaching a dead end. I could trudge back through the scenery or start all over again, but to be honest, either option felt like hard work. In a way, the lack of direction and help cheated me into this and as a result, I feel like my experience lacked the epiphany it should have had. My entire time with the game almost feels like a waste of time, and with no fast track options I was left to make the choice: restart, trudge or quit. The world feels mostly devoid of life. While the grasses and branches sway, sunlight breaks through the trees, the wind blows and occasional animal sounds are heard; it feels empty and lonely. But this is the point. I promised not to talk about the game in detail, but in one area – I’ll just say *dark mine* – the game sees to it that you have something to be scared about, both in a visual and audible form. There are jump scares ahoy if you’re not careful. The use of darkness and light from candles and torches is very atmospheric and helps claw at your fears. However, that completely depends on whether you’re afraid of the dark or not. For me, I had reached a point of reckless boredom and charged through the area like something demented. With varying levels of success, I did eventually find my way out. TVOEC manages to unhinge in many different places. It even tricks you by making things darker as you near them, so as to obscure and envelope your viewpoint of the world. But boredom in TVOEC is an interesting thing. I found it was self –perpetuated by me. The cause is driven by the need to discover new things, in search of that natural feeling of progression. Progression can feel lacking when you’ve run around every inch of an area and not found any additional hint of gameplay. But the gameplay is there, you just have to know how to find and activate it. I assume that both Myst fanatics and lateral thinkers alike will find some of the puzzles interesting, if not a little sparse once you understand how the gameplay ticks. With a lot of running from area to area, you’d assume there would be a run-toggle button, but there isn’t. With such distances to cover, you move at, what can feel like, a snails’ pace; with nothing to do but look and listen. It becomes an enforced travelling experience between locations I’d liken to Skyrim, but unfortunately it comes without the on-foot entertainment of bunny killing, flower picking and butterfly wing collecting. The game also suffers with fairly frequent stuttering while loading the scenery. You’ll also catch odd flashes of red and blue as you move about. The flashes of red and blue are easily missed, but they occur in the middle of the screen often when moving about the forest. These things can, of course, be caused by graphics card drivers and out of date codecs; reading the forums I confirmed I’m not alone with this experience. Maybe updating my graphics card will help or perhaps a bug patch is needed, but to be honest, I’m not about to rush out and upgrade solely for TVOEC. There are some truly stunning set pieces with a beautifully rendered countryside to navigate through as a backdrop, but it loses marks for the frequent loading pauses and odd flashing dots, but these may well be easily patched. Occasionally, I couldn’t work out what I was looking at, but that was only because the narrator tells you what it is you already know, so playing isn’t always the clearest, but most of the time it manages to be sickeningly horrible and macabre. The story feels familiar but fresh enough to keep you wanting to learn more about what is actually going on and why. 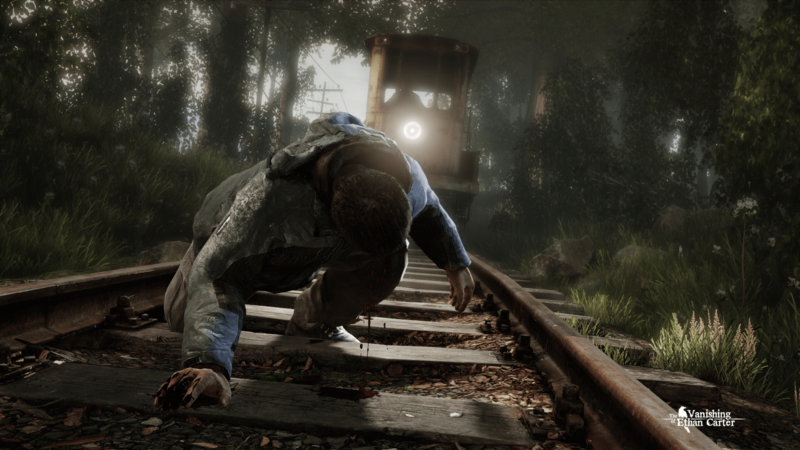 I didn’t personally feel any attachment to any of the characters, not even the game’s name-sake Ethan Carter, but still felt like a witness to the story as it unfolded. This is not a game for everyone, it can be a little meandering along its path, but if you’re clever at solving the puzzles the story, as short as it is, keeps the thrills and spills coming at a fair pace. Take time to work out what the prompts say and what happens when you move around. I don’t want to ruin any of this for you, so that is all I’ll say, but that is the point, you have to work it out of yourself. For me, there isn’t enough to make me want to start it again a second time, not just yet anyway.